Some kid performers played with Scrappy products as part of their professional obligations to Columbia. Jane Withers, one of the most popular child stars of the 1930s (and, much later, TV’s beloved Josephine the Plumber), actually liked the little guy. Well, I don’t know that for sure. 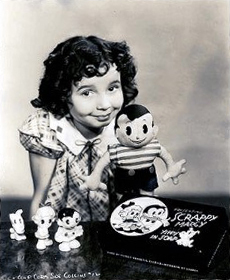 But I did recently stumble across the fact that Withers, who worked for 20th Century Fox rather than Columbia in the 30s and is a serious collector of dolls, owned two of Scrappy. Here they are, as photographed for an auction some years ago. 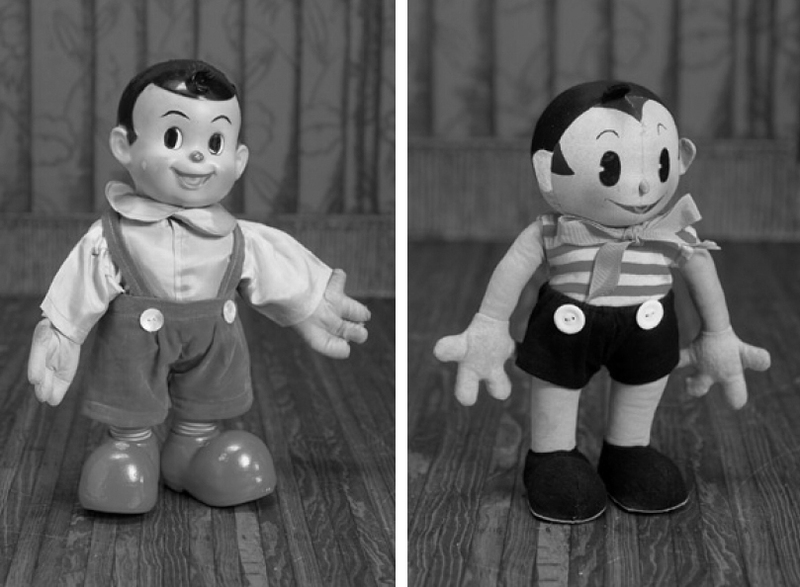 None of the Scrappy dolls I know about–I also have a small celluloid one and one sewn from a pattern–were exactly dead ringers for the cartoon character, but the striped-shirt one from Jane’s collection comes closest to capturing his likeness and spirit. I hope this doll isn’t so hopelessly rare that I’ll never have the chance to own it. Perhaps the person who bought Jane Withers’ one would be willing to sell it to me at a substantial loss. My doll is similar to the one on the left but has worn down quite a bit over the years. Does anyone have a pattern for the pants and shirt (not striped)so that my wife could recreate that original outfit? I recall the shirt was a shiny material and the pants were a red velvety like material. I don’t have a pattern, but would be happy to share color photos of my doll, whose clothes are in pretty nice shape. You’re right: His overalls are a reddish orange and velvety, and the shirt is kind of shiny and linen-y and off-white (which may be an artifact of being 80 years old). Yes, thank you. All the pictures that I have now are in black and white. I am a little over 80 years old and somewhat “off-white” myself.